Convenient online ordering this holiday season is now available! Get the party started with delicious Joey’s pizza, pasta, salad, and deserts. Click here to order online! Authentic New York pizzeria founded in 1999, Joey’s House of Pizza is a family owned and operated New York pizzeria. 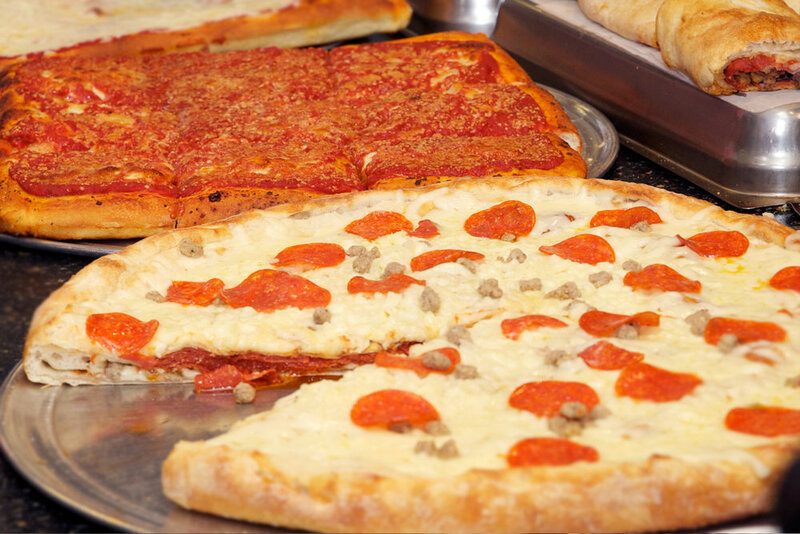 The Joey’s family is very passionate about serving the best authentic New York Pizza, Italian pastas, salads, calzones, subs and more! Their Brooklyn roots and Italian heritage merge to make northerners feel right at home with hand-tossed pizza by the slice and sicilian or double stuffed slices. Joey and his Family are dedicated to making all of their ingredients fresh from scratch everyday. Some of our specialty ingredients include Joey’s pizza dough, Joey’s famous marinara and pizza sauce, homemade meatballs, freshly grated and shredded cheeses. All of these wonderful components create a product of excellence. From the pizza pies to the pastas.. and don’t forget the cannoli! As Joey says “At Joey’s you get quality and quantity!” Thank You Nashville, TN for making us #1. We couldn’t of done it with out you! We Greatly appreciate your business! Joey’s Specialty Pie … Incredible! Meatballs, Italian Sausage, Chicken, Eggplant, Artichokes, Spinach. Add an additional $1.25 each per slice. Add an additional $3.00 each per pie. Take and Bake Pizza Pies! Please allow an appropriate amount of wait time on all orders during peak hours. All pizzas are made by hand! Stuffed with a plentiful amount of ricotta cheese and mozzarella blend. Fresh Spinach, tomato, artichoke, garlic, and blended cheeses ... delicious! Fresh mozzarella, tomato, fresh basil, drizzled with extra virgin olive oil... divine! Need a venue? Rent the restaurant for meetings and private courses. Contact us with catering questions, comments, or suggestions.